Are the Rangers Playing to the HBO Cameras? A 1-0 hockey game can be a thing of beauty, but last night’s Stars shutout of the Rangers was something less than memorable. The lack of emotion in the game has already been documented by the beat writers — and noted by John Tortorella, who admitted that "there was not a whole lot of hate out there." Said Brad Richards: "It was a boring type of game." And so chalk it up, if you'd like, to a matchup between teams that don't see each other very often, even though we'll note the Rangers have played games against Western Conference opponents this year, and the result hasn't quite looked like this. 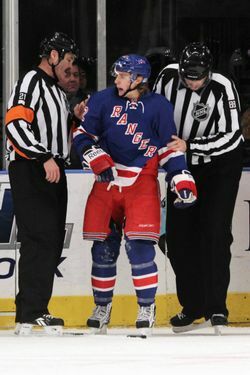 A couple of moments stood out, neither of them for good reasons (at least not to Rangers fans): One was a bogus penalty call on Carl Hagelin after a collision with Dallas goalie Richard Bachman. It's the kind of play Hagelin was born for: The puck was dumped in behind the Stars defensemen and into the Dallas zone, and Hagelin used his outstanding speed to try to chase it down. But Bachman left his crease to chase the puck as well, and there was a collision involving Hagelin, Bachman, and a Dallas defenseman inside the face-off circle. Hagelin was given a charging penalty, and Tortorella, understandably, was not pleased. As has been mentioned elsewhere, the call certainly appeared to be a sign of increased sensitivity to this sort of play, in the wake of the incident involving Milan Lucic and Ryan Miller last month. The other moment that stood out — aside from Trevor Daley's game-winning goal with 4:59 left to play in the third period, of course — was a scary one for the Rangers. Henrik Lundqvist took a Sheldon Souray slap shot off the left shoulder in the second period, and though Souray has had trouble scoring of late, he still has one of the hardest shots in the league. Lundqvist appeared to be in quite a bit of pain when Jim Ramsey was attending to him after the play, but he'd remain in the game. Said Lundqvist afterwards, via Newsday: "I got lucky." Added the goalie: "At first I thought it was the collarbone. It felt like the whole shoulder was a couple feet behind me." So yeah, last night might not have been pretty, but it could have been a whole lot worse.